We’re dedicated to encouraging customers to generate their own clean energy! 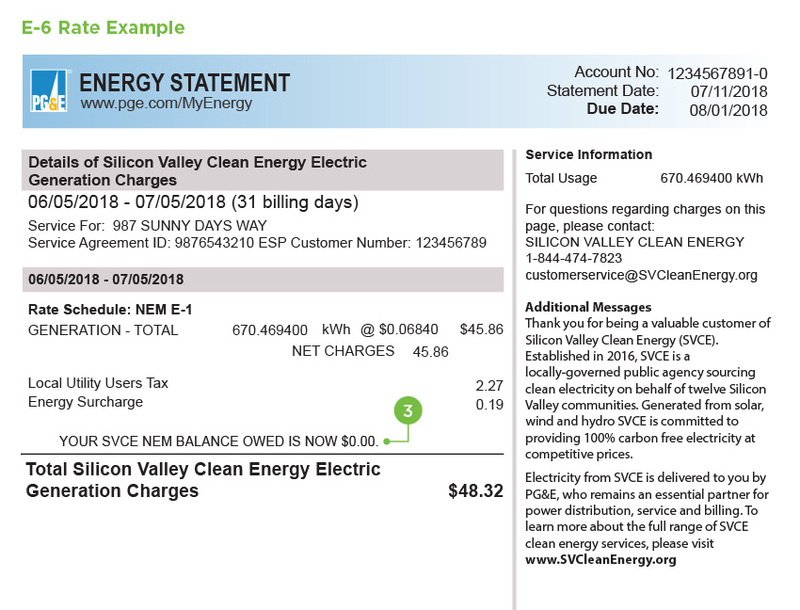 Customers with solar power at their home or business can take advantage of Silicon Valley Clean Energy’s attractive Net Energy Metering (NEM) program. SVCE values net surplus generation at your full retail rate, a much better deal than the 2-4 cent wholesale rate paid by PG&E. We bill you monthly so you don’t end up with a year’s worth of charges in an annual true-up. Excess credits rollover month-to-month. Credit balances over $100 for surplus generation are automatically paid to you in April of each year, up to a maximum of $5,000. Unlike with PG&E, SVCE NEM customers can ensure that when you do need additional electricity, it’s sourced with 100% renewable energy—at an additional cost of only $0.008/kWh. Upgrading to GreenPrime, SVCE’s premium 100% renewable energy service, pays an additional $0.008/kWh for net energy generation. A special meter tracks the difference between the amount of electricity your solar panels produce and the amount of electricity you use during each billing cycle. When your panels produce more electricity than you use, you receive a credit on your bill. And if your credits add up to $100 or more, you’ll receive a check from SVCE in April, up to a maximum of $5,000. If you sign up for Silicon Valley Clean Energy’s premium 100% renewable GreenPrime service, you will pay an additional $0.008/kWh for net consumption, but you will be credited an additional $0.008 for net generation—and excess credits roll over every month. Any SVCE customer who meets PG&E’s NEM program requirements is eligible for our NEM program. Generally, this includes customers with renewable electric generation systems (such as solar, wind, biogas and fuel cell installations) that are less than 1,000 kW. A typical residential installation is 4-5 kW, and the typical commercial installation is 100-200 kW. Silicon Valley Clean Energy’s NEM program is only available to customers within the SVCE service area. Customers outside of SVCE’s service area can still apply for NEM through PG&E, but will not benefit from SVCE’s attractive NEM tariff. Current NEM Customers. If you’re already enrolled in PG&E’s NEM program and you switch to SCVE, you will automatically be enrolled in SVCE’s NEM program—no action is necessary. Both PG&E and SVCE will perform a settlement of your account’s net charges and credits (known as a “true-up”) when your energy provider changes to SVCE or back to PG&E. This settlement will result in a balance due for any usage charges owed to-date, or alternatively will result in a forfeiture of any excess credits on your account at that time. New NEM Customers. SVCE customers sign up for the NEM program as usual, through PG&E. You will then be automatically served by SVCE’s NEM program. PG&E will provide final permission to operate your solar PV system and/or wind system, whether or not you are an SVCE customer. PG&E will review your completed application, along with a single-line diagram that is representative of your system. Upon a successful evaluation of your engineering review, PG&E will install your bi-directional meter. You may operate your PV system following receipt of a “Permission to Operate” letter. 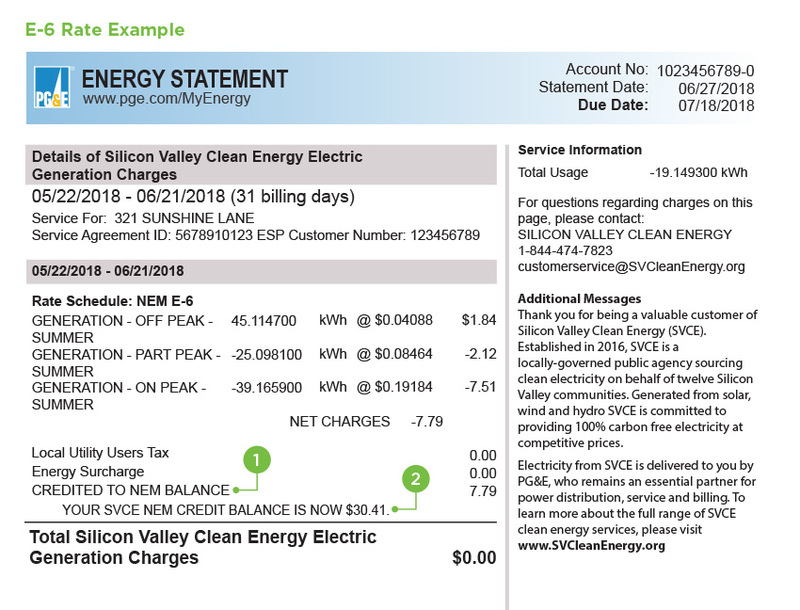 As an SVCE Net Energy Metering customer, you will see a NEM-related line item on the SVCE Electric Generation Charges page of your monthly energy bill. You’ll find details about the non-NEM charges in Understanding Your Bill. A new line is added to your billing statement indicating accrued Net Energy Metering (NEM) generation credits called “Credited to NEM Balance.” This is how much is added or subtracted from your existing NEM Balance, if any. This is your credit balance which will be applied to future months. If you do not have a credit balance, this message will show. Also, during April true-up, if you have a credit balance, the credit balance amount will show on this line indicating how much SVCE owes you.